Reference list and powerpoint of Fluency? Fluency. Fluency! The references I have in my poster can be found here. I want to thank UEC, and Professor Shi Jie for holding this event, and I look forward to more in the future. Greetings fellow teachers, researchers and everyone on the Internet! 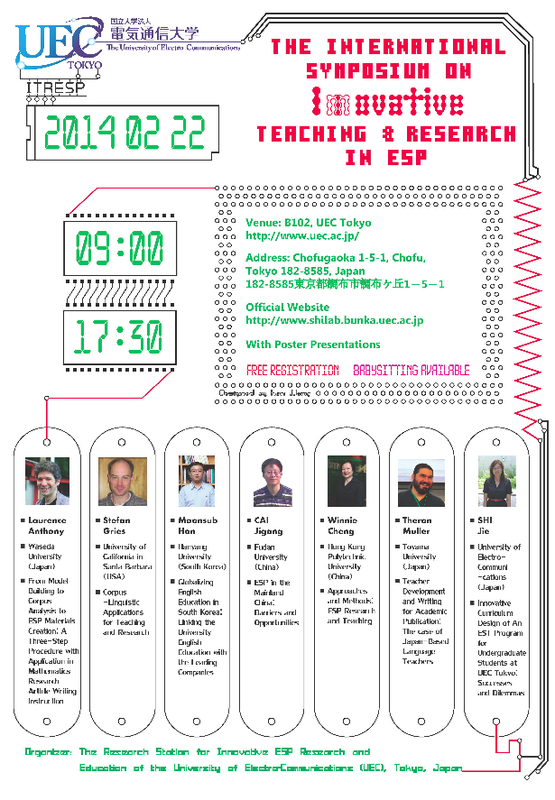 I am presenting a poster about my work with in-service Japanese teachers of English for junior and senior high schools at The International Symposium on Innovative Teaching and Research in ESP at the University of Electro Communications, Tokyo, on February 22, 2014. This time the focus will be on a writing workshop at our institution that we offer online using Moodle. What makes this moodle writing course unique is the fact that we provide three types of feedback:direct, audio and data-driven. The focus in particular will be on the data-driven part of the workshop and how the participants feel about encountering this type of feedback. This poster is also a chance for me to engage with other corpus and data-driven learning specialists in the field and get some ideas on how to approach this course with a research agenda, especially one focused on obtaining quantitative, as well as qualitative data. It is not that I am biased toward qualitative research, but most CALL and data-driven, corpus research has been primarily this way for a long time now. (Chambers 2007, Boulton 2008) and so the demand is high for this type of approach. Winnie Cheng (Hong Kong Polytechnic University, China)Laurence Anthony (Waseda University, Japan), Theron Muller (Toyama University, Japan). Just to meet and talk with anyof these specialists of the field would be a very speciai opportunity indeed. I also want to thank Shi Jie (Universityof Electro-Communications, Japan) for setting up this symposium. Much appreciation and thanks in advance for her hard work. If you plan to be at the symposium, please feel free to find my poster. According to the schedule the poster session goes from 2-3:30, so have a chat with me if you are around. Boulton, A. (2008). Evaluating corpus use in language learning: State of play and future directions. Paper presented at the Amerian Accociation of Corpus Linguisitcs, Brighham Young University. Chambers, A. (2007). Popularising corpus consultation by language learners and teachers. In E. Hidalgo Tenorio, L. Rodríguez-Navarro, J. Santana (Eds.). Corpora in the Foreign Language Classroom: Selected papers from the Sixth International Conference on Teaching and Language Corpora (TaLC 6). (pp. 3-16). Kenilworth: Rodopi. Teaching, learning, and research! Oh my!